This might be the creepiest sight Cawthorn has thrown our way so far. Occasionally when you boot the game, one of three images of Springtrap will show up. It seems to be pretty rare, and plenty of players may never get to see them. They appear to show Springtrap removing the head of his suit, revealing what you may assume is the endoskeleton head beneath. But, as we know from the minigames, it’s not an endoskeleton in that suit – it’s the purple man. Which means that head under the suit is actually a decaying corpse. Gross. Between the fact that the place is haunted and you’re having hallucinations, it’s no surprise the scenery all around you keeps on changing. Some of these include a poster of Springtrap randomly appearing on camera 10, a Shadow Bonnie plush that sometimes appears on your desk, the marionette’s mask in camera 8, Iand a paper plate Bonnie appearing on top of the box of junk. On top of that, although it’s hard to make out because of the static, it looks like Bonnie’s hiding on the left side of camera 6. There’s actually a LOT to do in the minigames. You probably played through the minigames at the end of each night, but you may not have noticed there’s actually a ton more. They’re all ridiculously difficult to reach because the only hints you’ll have as to how are all hidden in the main minigames. Remember the weird codes that showed up in the hallways, and the shadow bonnie? Those are all clues, and you need to play ALL the minigames to unlock the good ending. Yes, there are multiple endings in this game. Here’s a full guide on getting the good ending. Yes, Golden Freddy makes an appearance too. He’s just a hallucination, but he might show up in the left corner of your office. He also occasionally appears in the static of your cameras. Fun fact: you can honk Freddy’s nose on the poster in your office. Mangle’s back – also a hallucination. He might appear on your cameras, and if you don’t notice him at first, you will pretty soon as his presence is always followed by loud static noises. He might also poke his little head over the window to your office. Those noises attract Springtrap to your office, so Mangle, as always, is nothing but trouble. On the bad ending screen, you’ll notice there’s an extra animatronic’s head in the back that doesn’t belong to any of the original characters. It’s not certain who it is, but it’s a pretty safe bet that it’s Springtrap. Interestingly, this head is absent in the good ending screen. In the minigames, when you wander to the left you’ll find yourself in the storage room from the original game. You can see a bunch of animatronic parts on the tables, but there’s also what appears to be a human skull. What’s that doing there? Looking back on many of my old games, I’ve found that there is almost always a broken-down robot in them. I’m not sure why this seems to be such a recurring theme in my games, but it’s obvious that it’s something haunting me. Before I began work on FNaF, I had to choose what game to make out of three potential games, knowing it might be my last try before having to start a new career. I was choosing between a sequel to The Desolate Hope, a remake of my first game – Legacy of Flan, or a new idea about animatronics and security cameras. In the original game, Freddy was never originally meant to move around the diner and was only meant to “get you” if your time ran out. This was changed before release. In real life I tend to have waking-nightmares, meaning that I walk in my sleep, etc. One night I dreamt that Bonnie was in the hall outside my door, so I jumped out of bed and rushed to hold the door shut. I discovered that the door was locked and it filled me with dread. 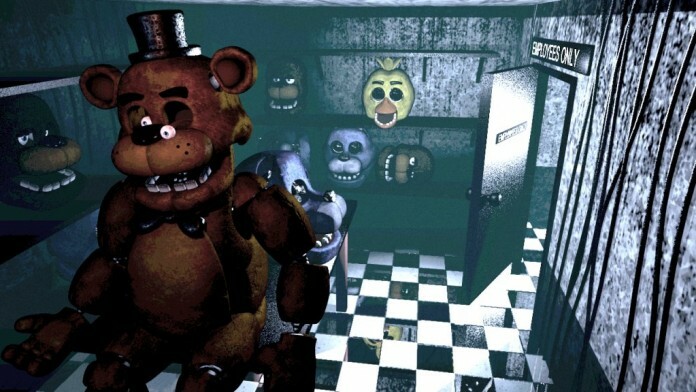 In FNaF 1, when the doors don’t work, it means something is already in your office! So when I felt that the door was locked, I felt like bonnie was in my bedroom and was about to get me! Thankfully, I woke up. I actually modeled the Foxy character on my laptop while riding on a 24hr drive to visit my in-laws over the summer of 2014. It’s very difficult to model a 3D character on a bumpy car ride. Maybe this is why Foxy looks so torn up! While we were there visiting, my kids got to experience Foxy’s jump-scare for the first time!